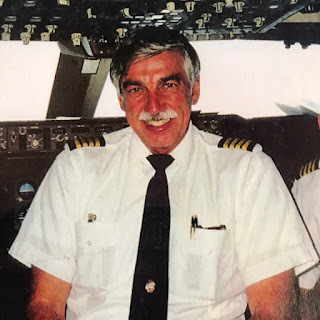 Word has reached us with the passing of RNPA member retired Northwest pilot Captain William Charles Fellinger, age 79. Captain Fellinger joined Northwest Airlines 04-26-1965. He is survived by his wife Sammy. Services are planned for July 30th at St. Victoria Catholic Church in Victoria, Minnesota. Interment will be July 31st at Fort Snelling National Cemetery. 6320 Maple Ridge Lane, Excelsior MN 55331-9645. Loving husband and friend, William “Billy” Fellinger, 79, passed away at his wife’s side on July 21st at his home in Excelsior, Minnesota. A decorated Navy pilot and retired Northwest Airlines 747 captain, Billy’s passion for flying was only surpassed by his devotion to Sammy, his wife of 35 years, and his beloved black Labrador retrievers, Carbon and Ember. A humble, brave and capable leader and patriot, Billy received letters of commendation for services rendered during the Cuban Missile Crisis and for quarantine of Cuba. Also, during his airline career, he flew Civilian Reserve Airlift Flights, carrying troupes and equipment to Saudi Arabia for the military during Desert Shield/Desert Storm in the early 90’s. Billy retired from Northwest Airlines after 38 years of service and then flew a corporate Beechjet for Ryan Construction. He continued to fly privately, enjoying the regular flights in his Bonanza airplane to Phoenix where he and Sammy spent time in the winter months. An avid outdoorsman, he enjoyed the company of his father and many friends in pursuit of his love for golfing, hunting and fishing. Billy was preceded in death by his parents, Gayle and William Fellinger of St. Paul, Minnesota. He is survived by his loving wife Sammy Fellinger and sisters Gayle Diehl and Joellen Jones. Funeral Services: We will honor Billy on MONDAY, JULY 30th at ST. VICTORIA CATHOLIC CHURCH, 8228 Victoria Dr., Victoria, Minnesota with a Visitation at 4:00PM and a Celebration of Life Mass at 5:00PM with dinner to follow. In lieu of flowers, Sammy asks that memorials are preferred to your local animal shelter in William Fellinger’s name. Interment will be held on Tuesday, July 31st at 10:30AM at Fort Snelling National Cemetery.